Time to feature recipes that are so simple they hardly qualify as such. Drain the chickpeas and dry them on paper towels. You need to prevent them from steaming, as much as possible. Place them in a bowl, coat lightly with olive oil, and add the spices of your choice, just a little sprinkle will do. Season with salt. Spray the basket of your air-fryer with olive oil. Set it to 360 F. Add the chickpeas and roast them for 12 to 15 minutes, shaking the basket every five minutes or so. Transfer them to a serving bowl, and sprinkle Parmigiano while they are hot. Enjoy right away, or store them for many hours at room temperature, uncovered. They are still excellent next day. 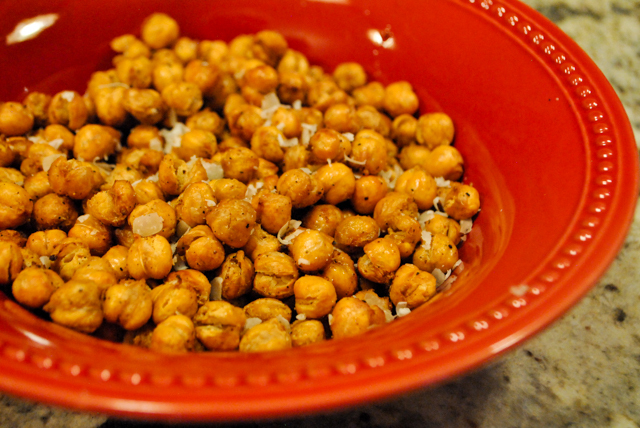 If using a regular oven, set it to 400F, and roast the chickpeas for 25 to 30 minutes. I’ve made them both ways, oven and air-fryer. The air-fryer gives a little more crunch, so it is my favorite method. The fact that it is so fast does not hurt it either! Beware, they are addictive. Perfect to nibble as appetizer but also quite good sprinkled over salads, spinach in particular goes well with crunchy chickpeas. Curry is a great spice to add to them before air-frying/roasting. Make sure to save them in an open bowl, they keep their crunchy nature better that way. Not that they will last that long. Only when they get to this point, move them to get some color on another side. Again, move them as little as possible, and wait for a deep color to develop. 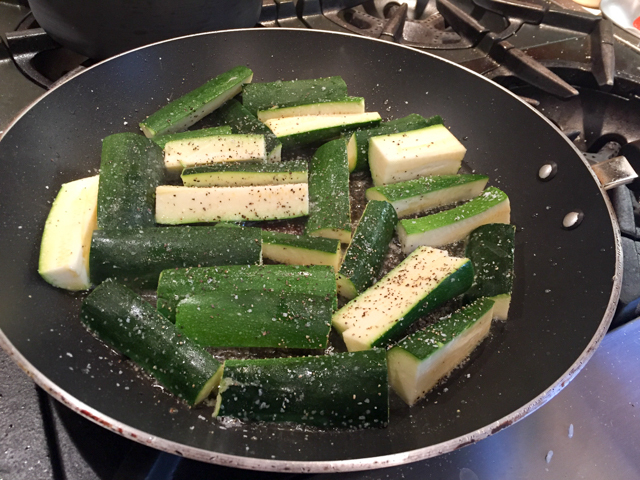 When the zucchini is tender (but not mushy), squeeze lemon juice all over, and shake the pan to move the slices around and gently coat them with the lemony glaze that forms. Serve immediately, adjust seasoning if necessary. and set it to 175 F.
Place 2 cups of rice on a quarter-sheet baking pan. Smoke it for one hour. 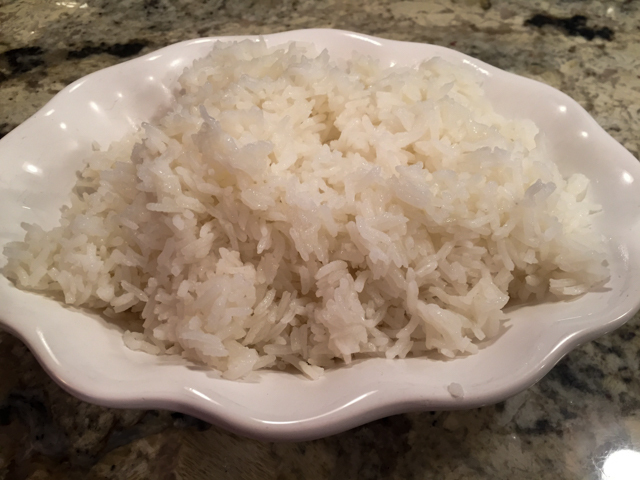 Allow it to cool completely, and cook the rice as you normally would. Heat the sous-vide to 170 F.
Place the sausages inside a food-safe plastic bag. Add the beer, season with a little salt and pepper. Use the water displacement method to close the bag. Submerge the bag and cook the sausages for 1 to 3 hours. Remove the sausages from the bag, discard the cooking liquid. Dry the sausages very well, and crisp them up on a non-stick pan with a light coating of oil, or on a hot grill. The sausages cooked sous-vide can also be kept in the fridge for a couple of days. When you want to serve them, place them in hot water for 5 minutes, then proceed to saute them as described. 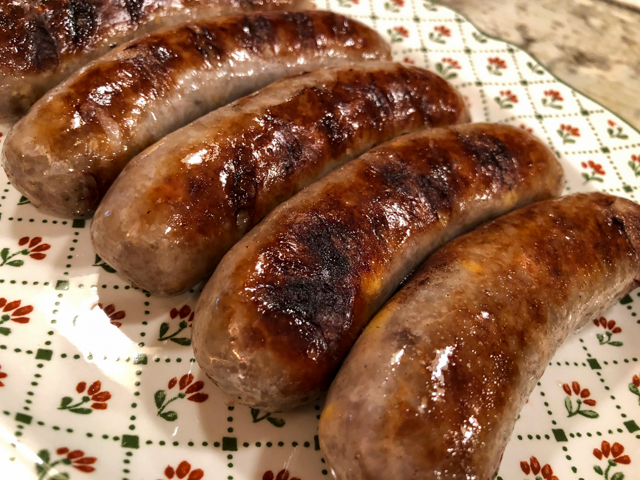 When we cook sausages on the grill, we go through a pretty elaborate method of switching them from the grill to a pan with simmering beer on top of the stove. They go back and forth, back and forth, from simmering to the grill, to make sure they end up moist and flavorful. The sous-vide delivers the same quality in terms of texture, without any hassle at all. I doubt I will cook this type of sausage any other way. Even warmed up in the microwave two days later, they were excellent. If you have a sous-vide gadget, give it a try. 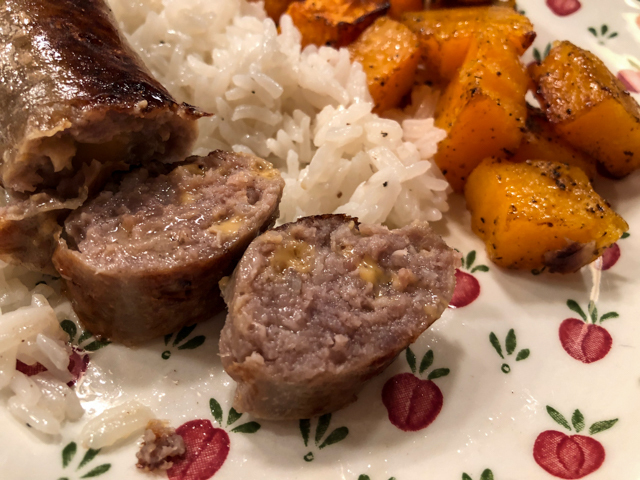 I realize that this series of Incredibly Easy recipes used an air-fryer, electric smoker, and a sous-vide, but except for the Italian sausages, all others can be prepared without any special cooking equipment. Time to showcase recipes that are so simple they hardly qualify as such. Hard to believe I had never made this dish until now. It is such a classic, but for one reason or another I only had it in restaurants and not even that often. Guess what? After inaugurating it, I enjoyed it three more times over the following month. It is so simple and so delicious! You must make it. I tried it with zoodles a couple of times, works wonders too. 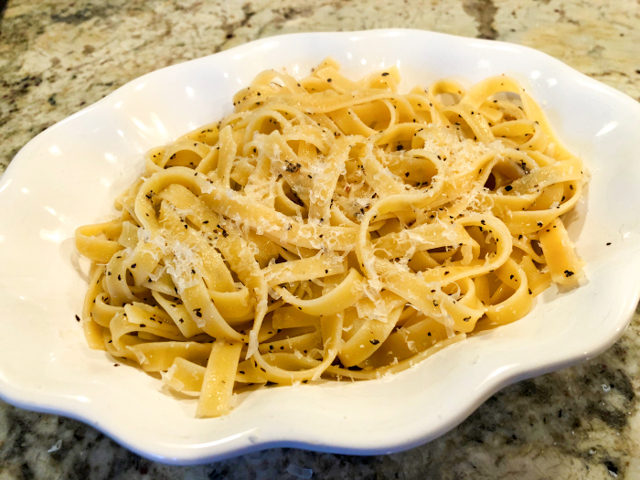 I was inspired by Geoffrey Zakarian in a recent Kitchen episode. 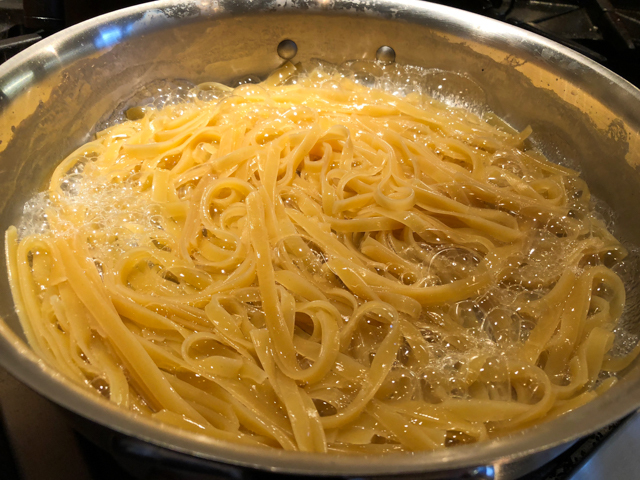 Two genius touches: first, you will cook the pasta in a pan just large enough to hold it, with about 1 inch water from the bottom. Add a little salt to the water. Cook without closing the pan until al dente. Second: toast the pepper in a small skillet until fragrant, just a minute or so. The pasta will be cooked with just a little water left, a water full of starch from the pasta. Turn off the heat, add the pepper and cheese. Stir well, adjust seasoning with salt. Heat some oil or butter in a non-stick pan. 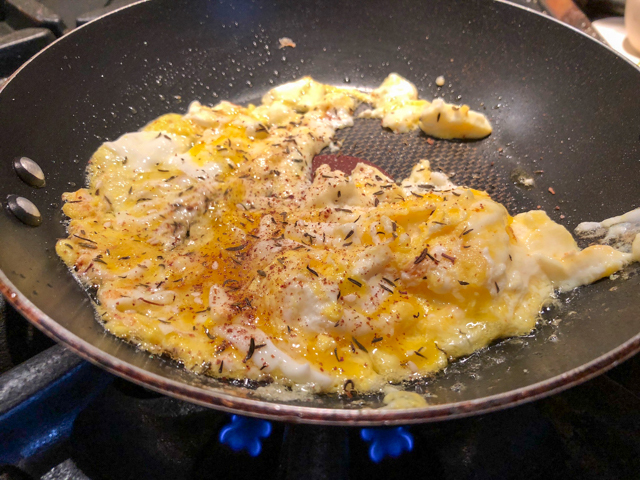 Don’t let it heat too much, add 2 eggs, slightly beaten, immediately drop in the center about 1/4 cup ricotta cheese, season with salt, pepper, and 1/4 tsp of turmeric. Cook, stirring gently over low-heat to your liking. Sprinkle za’tar when it’s almost ready to serve. Enjoy with bread or crackers. Cut new potatoes in half. Add to a pan with a little cold, salted water. Bring to a boil, cook for about 8 minutes. Drain. Drizzle a little olive oil, salt, and Herbes de Provence. Place in the air-fryer, cook at 390 F (or as high as your machine will go) until crispy, 15 to 20 minutes maximum. Shake occasionally. The pan, not necessarily yourself, but depending on what’s playing I say go for it. 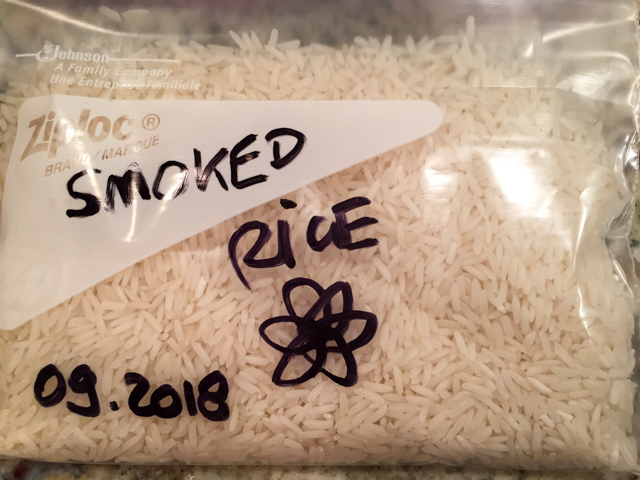 We eat rice often, usually plain. But every once in a while it’s nice to guild the lily a bit. I love the color of turmeric and the flavor of cardamon. Together they make a simple bowl of rice shine. Literally. Inspiration came from the newest book by Nigella Lawson, At My Table. Add all ingredients to a pan. Bring water to a boil, reduce heat close tightly the lid. Simmer for 20 minutes without opening the pan. 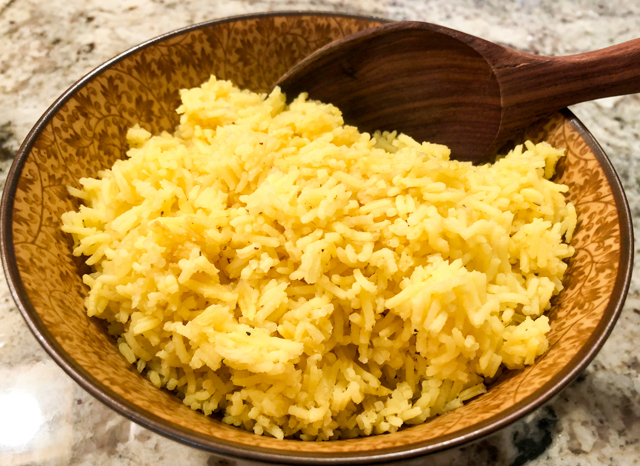 Turn off the heat, open the lid, add a tea towel on the surface of the rice, close the lid again. Let it rest for 10 to 30 minutes if you have the time, but it’s still nice if served right away. 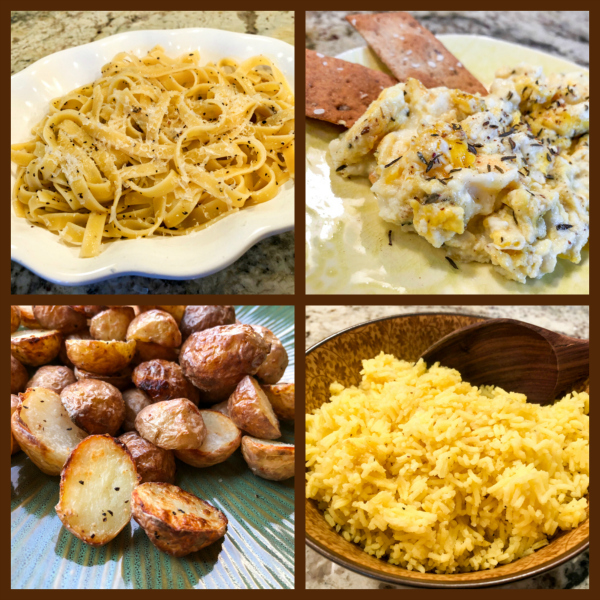 I hope you enjoyed these simple recipes. It’s nice to have a bunch of quick choices that you can make without even thinking too much. The scrambled egg, for instance, I don’t even measure anything. 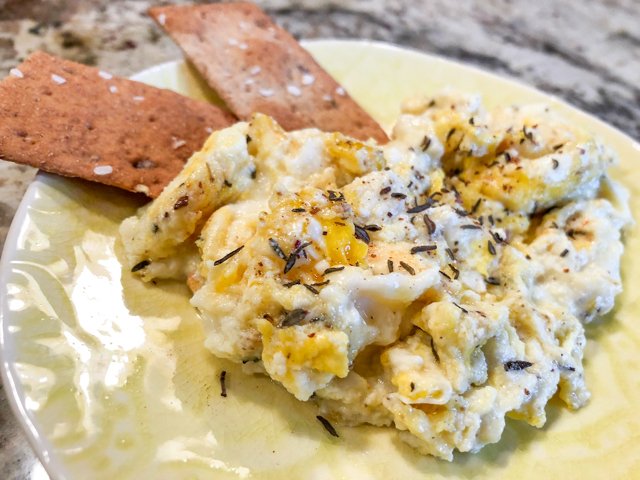 I sprinkle some turmeric, I add ricotta until I feel it’s going to be creamy enough, sometimes I add za’tar, sometimes Herbes de Provence, it’s never exactly the same twice in a row, but whatever you do it will be delicious. 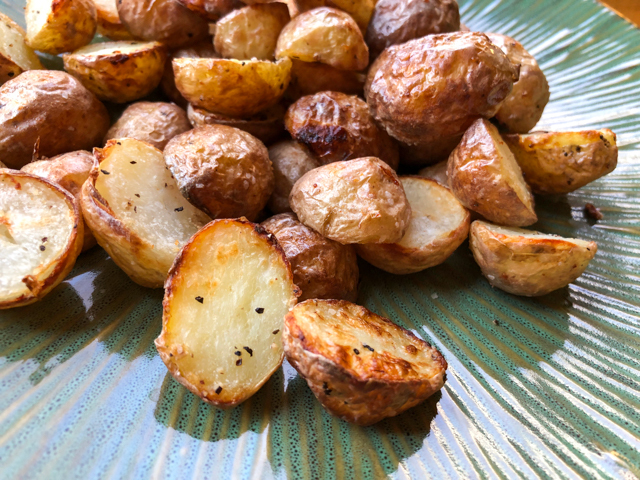 New Potatoes: if you don’t have an air-fryer, you can still do the same on top of the stove or even roasting them in a super hot oven. The texture I get with the air-fryer is pretty unique, though, and allows that fried aura without too much fat. Love it. It’s done. 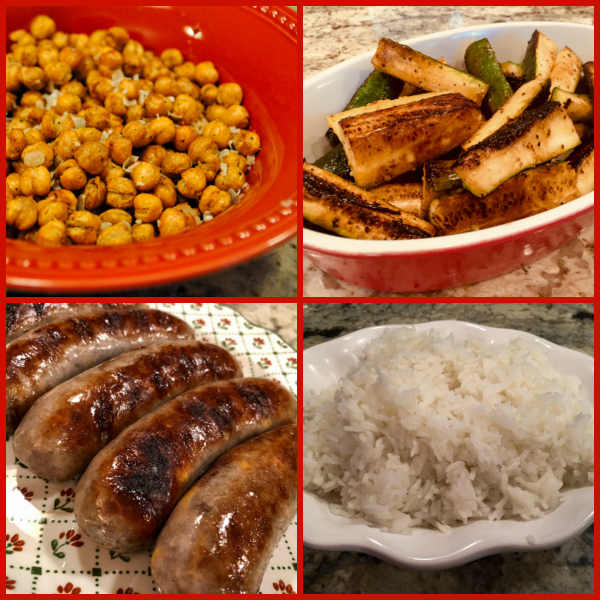 I just added a new category of recipes to the blog, entitled Incredibly Simple. You can find it on the right side, scrolling past Blogroll. Under this new category I list recipes that are almost effortless to put together. In the near future I will also make a separate category in the index page, so they are not only easy to make, but also easy to find in the site. 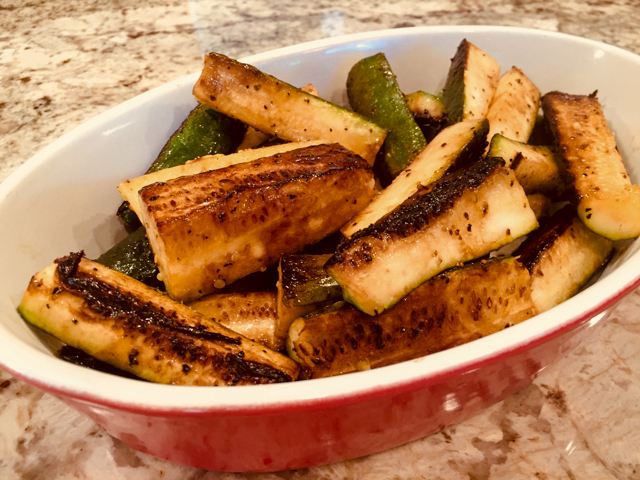 For this round-up I share four side dishes, one uses the air-fryer. I am aware that not many people own one, but I was so amazed by the outcome that I had to include it. You can of course make it in a regular oven… it will just take a bit longer to reach the dinner table, and the texture won’t be quite the same. The simple part of this method is the steaming. I’ve been using it all the time now. 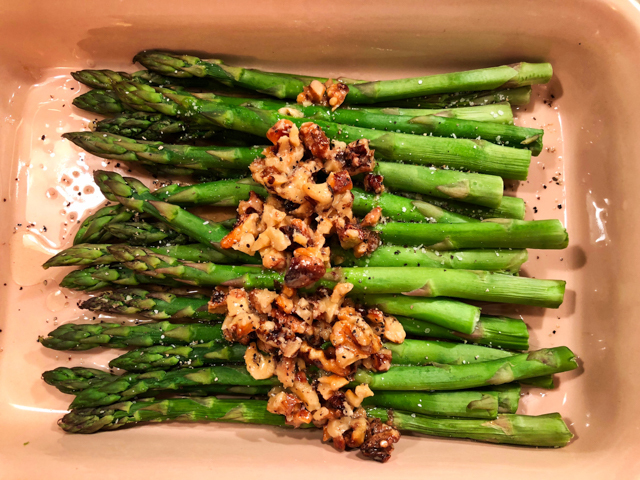 Place asparagus in an even layer on a large microwave-safe plate and season with salt and pepper. Lay a double layer of damp paper towels on top of the stalks, completely covering them. Microwave on high for about 3 minutes. Check with a fork, if necessary add another 30 seconds to 1 minute. That is it. You can dress them super simply with a mixture of olive oil and lemon juice, or if you have a bit more time, go for this simplified walnut vinaigrette. Toast half a cup or so of walnuts in a skillet or oven. Coarsely chop them and place in a small bowl. Add 2 tablespoons of a mild vinegar, 1 tablespoon of water, a very light drizzle of honey or maple syrup. Whisk 1/4 cup olive oil, until it all emulsifies. The walnuts will help the process. Season with salt, and add on top of the asparagus fresh from the microwave step. That is all. You want to know a little secret? The exact same method works well for broccolini too, you might have to slightly increase the steaming time. Inspiration for this recipe came from Geoffrey Zakarian on a recent episode of The Kitchen. Don’t let the simplicity of this non-recipe fool you. The result goes well beyond expectations. As GZ put it on the show, the combination of orange and avocado is a complete winner, and we agree. The only work involved is segmenting the orange. 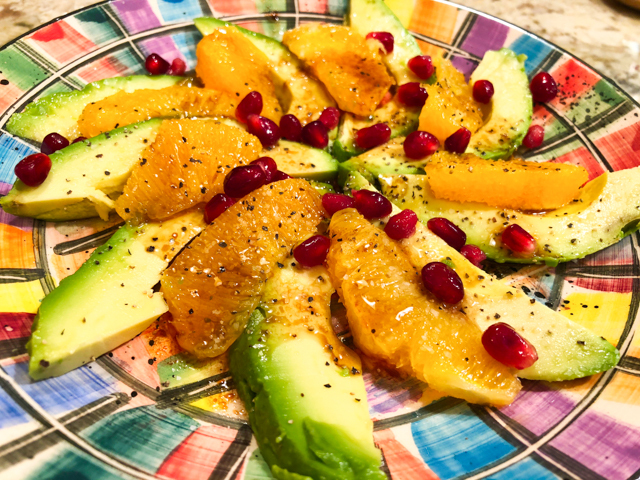 Distribute the slices of avocado on a plate, add orange segments on top. Squeeze all the juice left from the orange in a small bowl, season with salt and pepper, whisk a small amount of olive oil to emulsify it. If you like your dressing on the sweet side, a touch of honey will do. Drizzle on top of the salad, and sprinkle pomegranate seeds on top. You can also substitute toasted slivered almonds or walnuts in case you don’t have pomegranate around. I’ve made it twice in the same week, and intend to keep bringing this to our table. Blood oranges would make it even more special, so keep that in mind. Inspiration for this recipe came from Dining In: Highly Cookable Recipes, by Alison Roman. Put a baking dish in the oven and heat it to 425 F. You will need broccolini, one lemon, and freshly grated Parmigiano cheese. Add one or two bunches of broccolini to a large bowl, add to it very thin slices of one lemon. 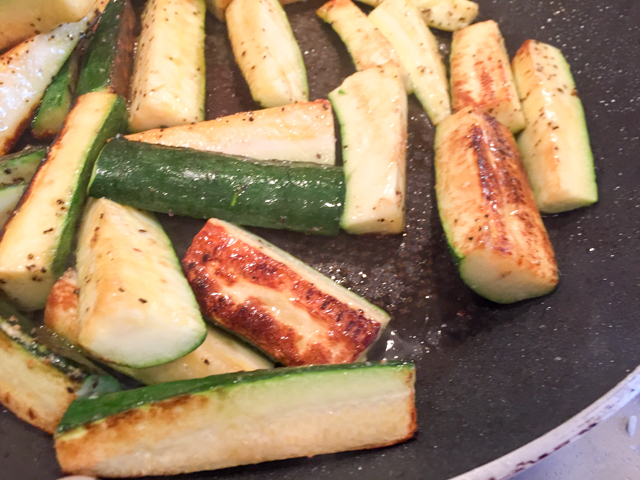 Drizzle olive oil all over, just enough to coat the veggies and lemon slices. Season with salt and pepper. 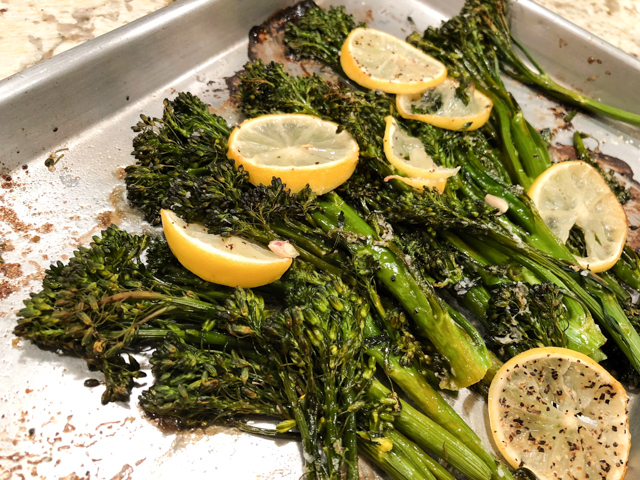 Place the broccolini on the hot baking sheet in one layer, add a small coating of grated Parmigiano cheese and roast for 10 to 15 minutes, until it all starts to get golden, and the broccolini is cooked through. The cheese will more or less disappear, but you will notice its sharp bite as you bite into the broccolini. Super simple indeed, and absolutely delicious. This is really a non-recipe if I’ve ever seen one. Fork the skin of the sweet potato a few times. Rub it with olive oil, season with salt. Place in the air-fryer set at 390 F or the highest temperature your machine will go. Cook for 35 minutes, turning it once or twice during frying. Remove from the fryer, cut the skin open, add some butter, salt and pepper. That’s all. What amazed me about this recipe is that you won’t have to wait for the oven to heat to high temperature to start roasting. The air-fryer needs no advance notice. You turn it on, in a minute or so you are right where you need to be. For whole potatoes or sweet potatoes, it’s hard to beat the convenience of using the air-fryer. And the texture turned out perfect, I think better than a regular oven. We would need a blind test to be sure, but I tell you, this was really really good. Apparently regular potatoes can be prepared exactly the same way and won’t take more than 40-45 minutes to be done. They are on my list for the near future. So that’s all for now… Four recipes that are so easy to put together, no matter what happened at work, you can face their preparation with a smile. Making life simple is always a good move. ONE YEAR AGO: Two Salads and a Blog Award! THREE YEARS AGO: Somebody Stop Me!